I am truly not even present to view them, nor do I need to be. Something is different, perhaps amiss for this edition of AIPAD, New York and it explains everything that I personally find interesting about photography as it converges with contemporary politics and representation. The gravitas of the entire spectacle is the specific lack thereof. It is an engagement with politics, commerce and our world and there is not a single photograph to provoke it. That is the point. Photography and its capacity to relativize meaning, politics and general human experience by way of a “document” is an absolute failure of reason. Images do not speak, they do not qualify an understanding of the moment photographed, but become ineffectual, if idiosyncratic nodes of visual information open to interpretation. The experience of a photograph is not what it in itself details, but rather what is delineated by the non-specific relationship that an author and an audience have to it based on the qualifications that each party has drawn up with his or herself and the experience they have with the world at large at any given time. This is a small but infinite gesture loaded with non-distinct “truth” and is fecund with the possibility for relative meaning and also a complete disavowal of that potential. The qualifications for its political usage is therefore marginalized to the individual no matter the collective capacity to deem images iconographic or to dictate an agency of status quo for their interpretation. Political will is always and will always be separate from a photographic work tendered to the categorization of falsely recognized truth de facto of real-time experience. Photographs are lived, not recorded. They are fluid. Their possibility for subjective meaning shifts by increasing moments. They are never truly fixed. From 1992-1997 artist Tom Friedman created a non-photographic work entitled “Thousand Hours of Staring”. The work is a blank sheet of white paper that hung in the artist’s studio in which Friedman cogitated over its ability to be recognized, as a work of art through the sheer will of his ability to stare at it. He worshipped the paper daily. He refers to the medium of the piece as “Stare on Paper”, thus creating an artwork of paralyzed and metaphorical lividity under which its potential is only activated through his gaze, blue or not and the imagination and experience of the viewer. It’s not much to look at, but yet sums up distinctly the importance between authorship, intention and spectacle and thus the void does stare back. This year the greatest photograph or booth of photography at AIPAD is hosted, or rather not hosted by Ag Gallery from Tehran. The photographs on show accurately describe (in my mind) the complete summation of 2017, American politics and the place in which I find myself in dialogue with the photographic medium’s ability to excite and nullify attempts at representation in equal measure. The photographs are hard for me to explain to myself and harder for me to explain to a fellow enthusiast, let alone a dead hare. If I could explain them, I would suggest a looming opacity involved in each image. I would try and describe what lies within the frame when I PROJECT its presence. I could talk of composition, the fastidious nature of political will within or perhaps I could argue that they are photographs that imbibe an imbalance of suffering on the subjects previously in front of the lens. However, as it stands, I am only allowed to imagine their countenance within the booth. Their contemplative and still nature require that I absorb their totemic value and place myself and the summation of my being within their non-existent will to be determined as artworks within a fair of commercial value. I am truly not even present to view them, nor do I need to be. I have been given a context from which I am spring boarding their importance because this is my relationship to photography. The photographs are not shown with an Iranian gallery called Ag Galerie from Tehran whom I have never heard of. I am positive that the works are political. I am positive without looking at their gallery on-line that Shirin Neshat is responsible for the gallery’s success because I am an ignorant Westerner with limited personal experience with Iran and its photographers. It doesn’t matter because these are the most important Iranian photographs ever not shown. They are glorious in the abnegated repose. And the void does stare back. What we may also consider with this exhibition is a certain sort of inadvertent forensic conceptual artwork. The booth stares back, empty, diffused of tangible evidence. There are signs of a struggle and signs point to criminal energy within through the absence previously spoken about. The walls and overhead lighting add to the sense of stillness, its meaning obfuscated by stark confines. We are missing the obligatory police line tape, but I do wonder if the booth will be contained for the weekend, perhaps by a chain offering more possibility to the consideration of its forensic presence. The discipline of conjecture or imagination is the ability to fool its participants into projecting its possibilities as potentially exemplar by proxy of subjective internal and external argument. What are our arguments in 2017 for reading the political will of absent artworks from Iran? 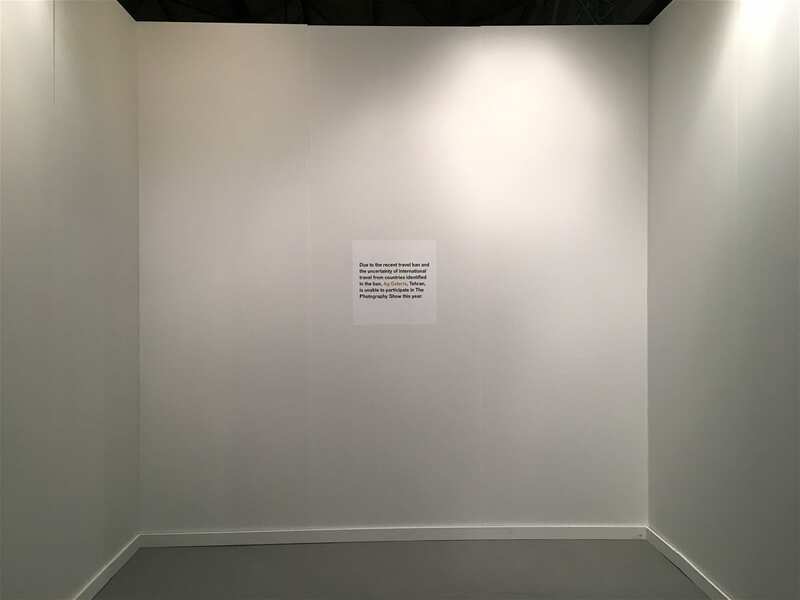 Ag Galerie or perhaps an AIPAD intern has stated that as an explanation that its booth remains empty at this years AIPAD exhibition due to being one of several countries in which its denizens are singled out as persons non-gratis for entry into the borders of Trump’s America. The gallery has placed a placard in their booth, a sole testament to their absence, not dissimilar from a gravestone, cenotaph or memorial that reads…. 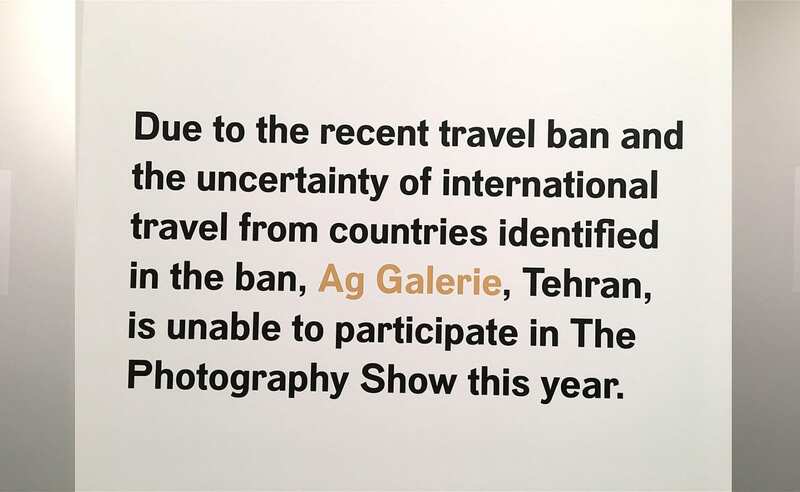 ”Due to the recent travel ban and the uncertainty of international travel from countries identified in the ban, Ag Galerie, Tehran, is unable to participate in the photography show this year”. The placard has been unceremoniously (not to disqualify a solemn ritualistic effort) taped or blue tacked to the booth wall. I was kindly sent images from Paul Kopeikin of the eponymous Kopeikin Gallery, Los Angeles of the lonely sign in the booth. In the images Paul sent, you are able to observe him back out of the empty booth by the framing of his phone camera. You have the placard up close and in each subsidiary image, it gets further and further away adding a level of existential possibility with every step that I imagine him taking until the last image stands stark and at a distance with a lonely light to illuminate its presence and the non-presence of photographs. And yet, within Ag Galerie’s booth lies every possibility for the relationship we should consider having with photography in the political sphere-its lack of finite representation, its sheer power when it is unavailable to persuade and its greatest gift –to stare back at us from the void of infinity. This is by far the most interesting thing I haven’t seen in photography for some time. Its complete absence is the locus for which ideas spring forward and in which the real power of conceptual political practice is possible, if accidently and if at a cost to its sponsors. We notice when things go missing. We create posters for them. We lament their return and hope that two parties are reunited over a piece of A4 paper with the photograph of a cat or a dog, which is not so dissimilar to the image in the booth. It is through the negation of value that its absence declares its greatest potential to ascribe the possibilities of what can never be. We may project ourselves onto these non-images, inhabit them and think through their potential to be regarded by the individual without ever setting foot in a commercial trade fair. This is by far the most interesting thing I haven’t seen in photography for some time. Its complete absence is the locus for which ideas spring forward and in which the real power of conceptual political practice is possible, if accidently and if at a cost to its sponsors. In an age of political instability and uncertainty, we are talking more about the current state of things by being forced to miss something and that is the trigger that may begin to undo the trauma of our languishing speech about these issues. Posted in Exhibitions and tagged AG Galerie, AIPAD, art fair, Art Market, Brad Feuerhelm, Iran, Kopeikin Gallery, Paul Kopeikin, Shirin Neshat, Tom Friedman.